Nicky's Vietnamese Sandwiches now has an outpost in the East Village. Banh Mi sandwiches served on a crispy baguette range from the Classic with pate, shredded pork and Vietnamese ham to Roast Duck topped with picked carrots, cucumber and fresh cilantro. Noodle dishes are also offered, including grilled pork chop. 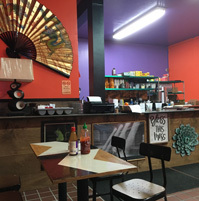 There is Shrimp Papaya Salad and an assortment of Pho noodle soups. Vietnamese coffee (hot or iced) and bubble teas are also on the menu.